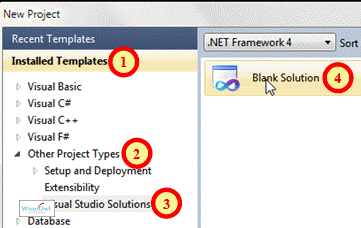 It's been irritating the author for a long time now that some websites weren't showing up as recent projects in the Visual Studio FILE menu.&nbsp; The reason is that they didn't have an associated solution - this article shows how to create a blank solution and add your project to it, thereby removing the irritation! I've just solved something which has been quietly annoying me for many moons, so thought I would share it before I forget. 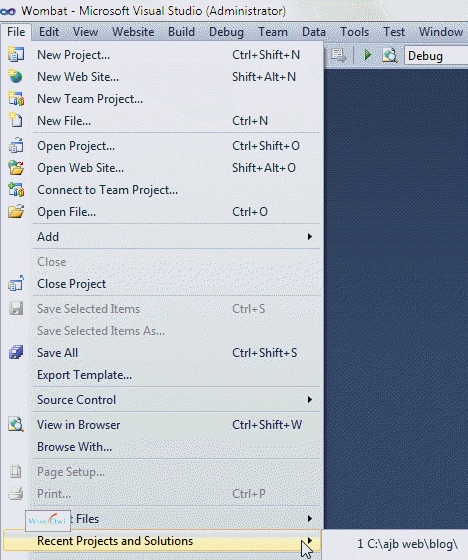 I refer to the fact that some websites that I open in Visual Studio don't show up in my Recent Projects list. Here the blog website is showing up - but it used not to! The reason is that these projects don't have an associated solution, so the workaround is to create a blank solution, then add your websites to this solution. Here's how to do this for Visual Studio 2010 (I suspect that the process is the same for VS 2005 and VS 2008). It doesn't matter where you put your solution, but Visual Studio will force you to create a new folder for it. If you now exit Visual Studio then go back in again, the solution that you created should be the first item on the Recent Projects menu!